I'm sure this project is going to seem dated and futile to many. Why fix a past-generation PC and add an obsolete graphics port? What's the point? The only thing I can say is that I don't actually need anything better than a higher-end Core2Duo and 8 gigs of ram for what I'm doing so I don't mind older gen hardware. It's also cheap. 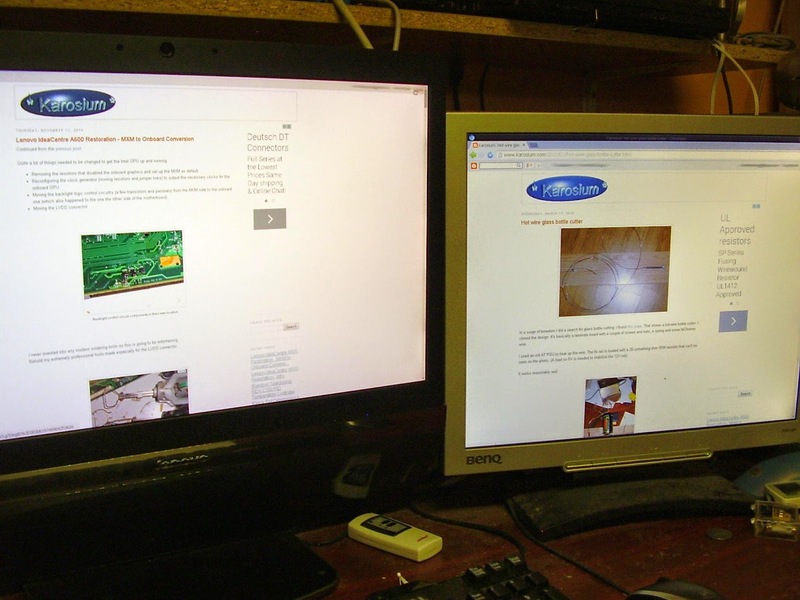 The 21" display is an upgrade compared to the 19" 4:3 monitors I used before, but I still didn't mind using those that much and I have 2 of them like I mentioned in the first article, one of which still has "fresh" CCFL tubes. So if I could keep using that one in conjunction with my "new" PC I'd be fine with that even if it's through VGA. Looking through the schematics of the motherboard I found that it has unpopulated VGA output circuitry that ends in a set of test points. A parts order and some hours later here's the (admittedly pretty terrible) result. In my defense, these passives are 0402 and I used the same soldering guns I showed your earlier with really thin wire for the tips. I'm surprised I managed to maintain my sanity throughout the process and end up with something that actually works. Probably could've gotten an FPC connector with pin pitch closer to that of the testpoints but flat flex cable for that was around 5 times the price of this one. Go figure.. It works pretty well even though everything's unshielded. See the conclusion in the next post. Im surprised you didnt have to do anything with the bios. There are Acer laptops 5/7 series) that come with MXM/onboard gfx variant motherboards, and 'simple' electrical conversion is not enough, bios is hardcoded to wait for proper gpu init. Yeah I lucked out on that front. I did find a single bios dump on some russian forum that I could've tried as a last resort but never ended up needing it.